Sorry for the long overdue absence but nothing has come in…until now! 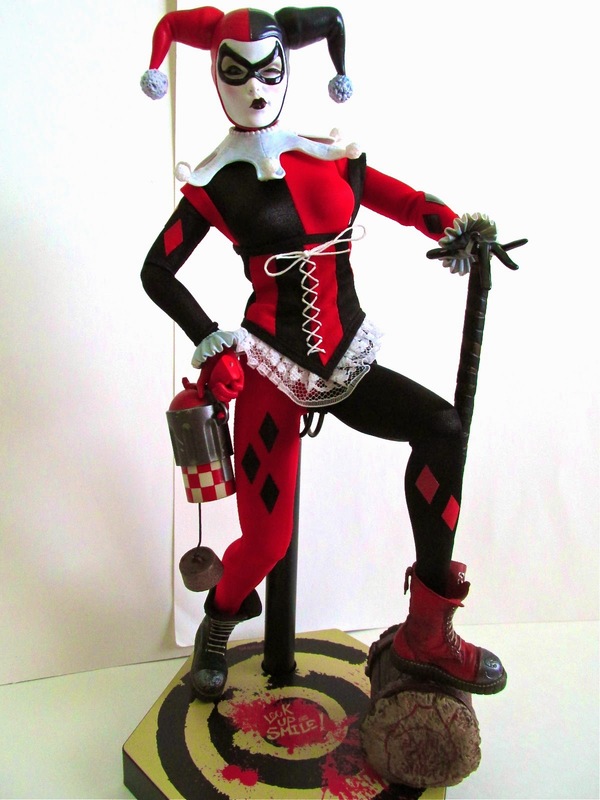 I bring to you this week Harley Quinn from Sideshow’s new DC Comics line of 1/6th scale figures. These figures are not based on the movies but more on their comic book incarnations. The line first started with the Joker, and Harley is the second release with more characters to follow. 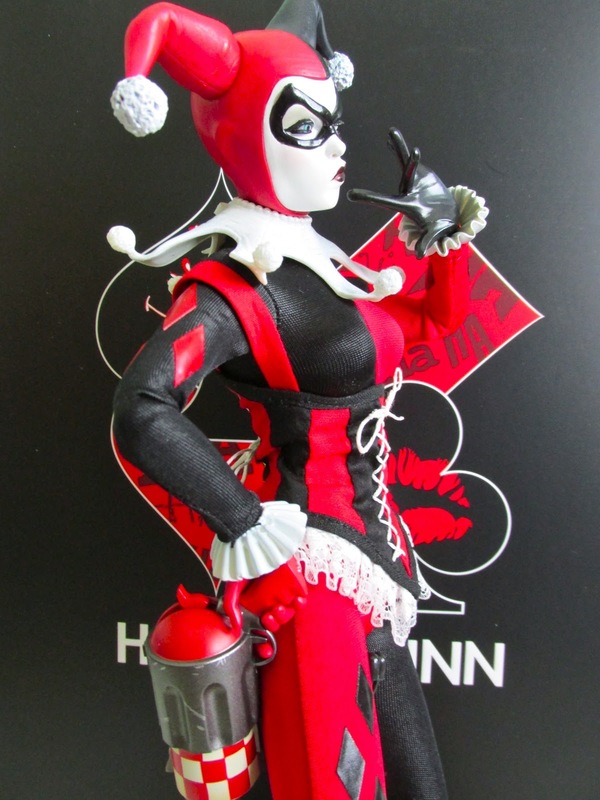 I wasn’t too sure what to expect from Sideshow’s line of 1/6th scale figures, but Harley has since given me great confidence in this line. 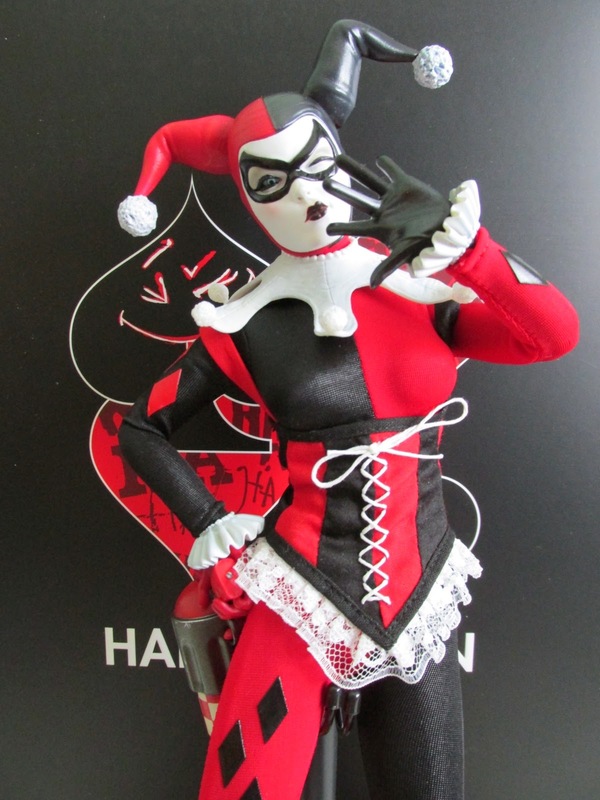 Harley is dressed in her classic look from the animated series and comics. She comes wearing a full body leotard and a matching corset, which seems to be able to come off if you don’t like that look. Although the leotard restricts some of the movement, the figure still has good articulation, and you can pull off some great poses. 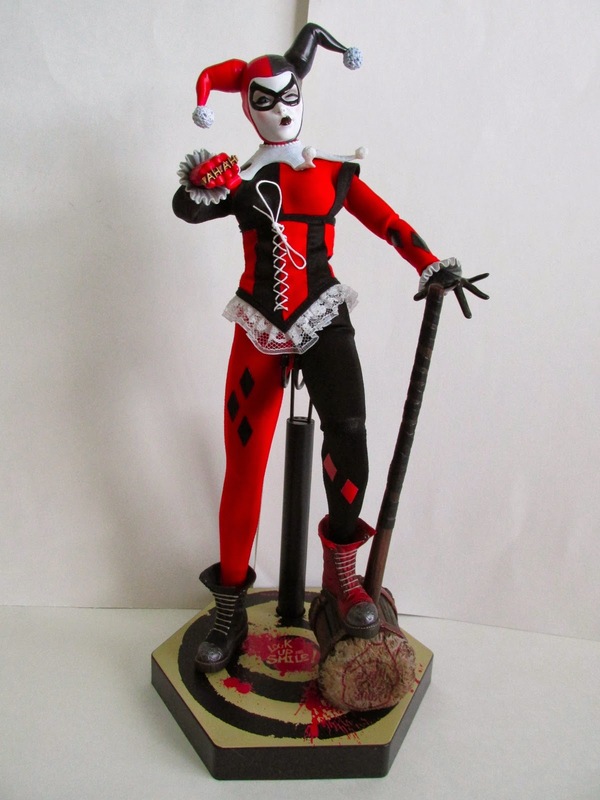 Harley comes with two alternate heads, a giant mallet, an assortment of hands for various poses, one hand holding a syringe, one hand with brass knuckles, a cork gun, a base with cradle, and the ex exclusive butcher knife. First off the head sculpts are quite amazing and are very photogenic. 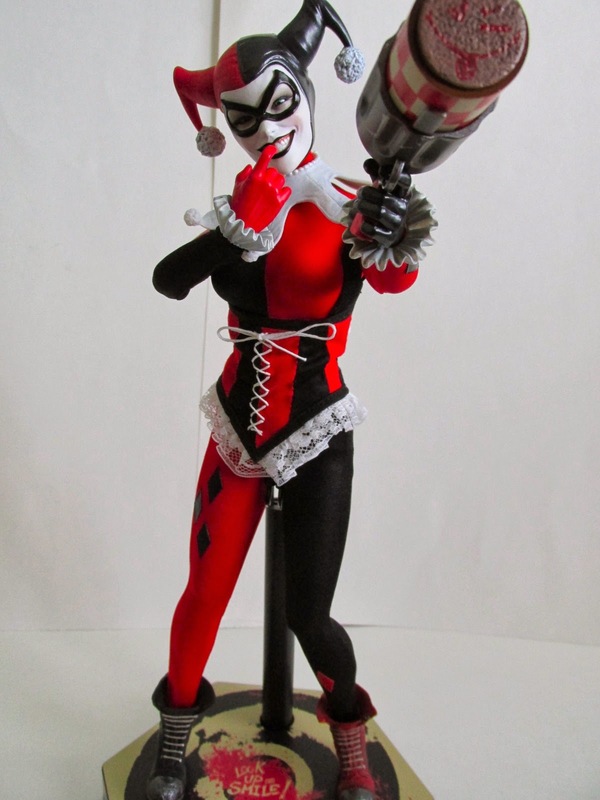 It is hard to decide which face to display with since both really capture the mischievous yet sadistic nature of Harley. One face is of her smiling and the other is of her puckering up and winking. Both heads have movable tassels and are another great addition to really show off some personality with this figure. The face sculpts really shine though on their paint apps. Great detail has been put into the face and the paint only makes it look even better. Sideshow has always been known for their paint apps, and it is great to see they have brought that same level of excellence to their 1/6th scale figures. I didn’t really encounter or see many flaws in this figure. The only thing might be that the joints on the limbs feel kinda loose and, in some cases like holding the mallet, the limbs could not support any real weight. By far one of the best accessories is her brass knuckles. The brass knuckles reads “HAHA” backwards and is just a nice comedic, yet dark touch that really sold me into getting this figure. Another great accessory is her base which is a bulls eye with “Look Up and Smile” written in blood. 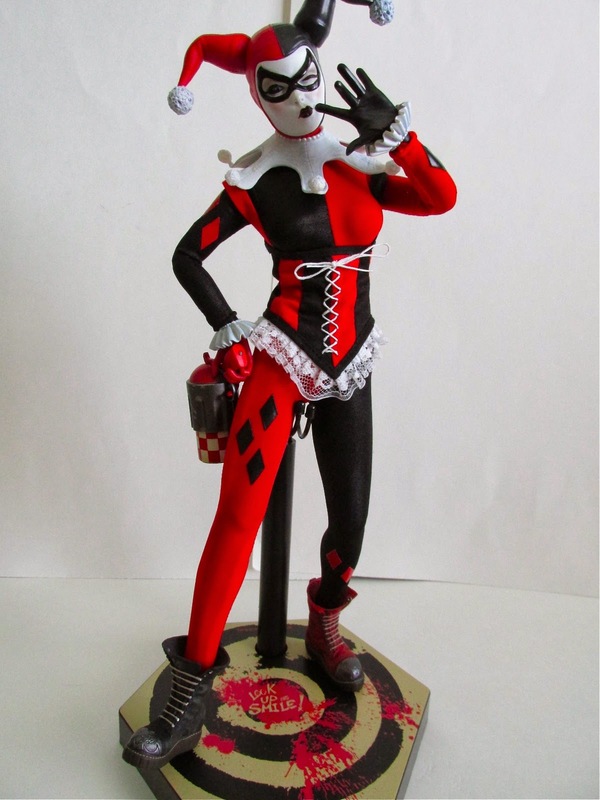 Again another great addition that really sells who Harley is. This is a great figure, and I was very pleased with how it looks in hand. I’m hoping that Sideshow will make a 1/6th scale Poison Ivy in the future, which is another reason why I made the jump to buy Harley. Can you imagine Harley and Poison Ivy displayed together?